In Egyptian mythology, Amunet (also spelled Amonet, Amaunet, Amentet, Amentit, Imentet, Imentit, and Ament) was a deity having several different characteristics during the long history of the pantheon of Ancient Egypt. Initially, Amunet was the female aspect of an abstract concept for air and invisibility and aspect of Hathor. This deity was without gender, but divided between Amunet and Amun for female and male aspects. They were the two aspects of the primordial concept of air and invisibility in the Ogdoad cosmogony. This included eight deities worshipped as pairs in Hermopolis during what is called the Old Kingdom, the third through sixth dynasties, extending from 2,686 B.C. to 2,134 B.C. Of the name for primordial air meaning, (one who) is hidden, the female aspect is Amunet and the male aspect is Amun. As the deity became more significant, eventually both aspects of the abstract concept were depicted as independent deities and identified as a pair. As with all goddesses in the Ogdoad, Amunet was depicted either as an Egyptian cobra snake, or as a snake-headed woman. The male deities in the Ogdoad generally were depicted with the head of a frog. Amaunet was said to be the mother who is father, implying that she was a creator who needed no male to procreate, reproducing asexually through parthenogenesis. The Egyptians thought that animals without sexual dimorphism, such as snakes, were all female. As Amunet continued to be identified as the goddess of air, she sometimes was depicted as a winged goddess, or as a woman with a hawk, or ostrich feather, on her head. She also is depicted with one of the hieroglyphs for the concept "West" on her head, on which the hawk or ostrich feather rests. Her name means "She of the West", as she is regarded as a personification of the direction West. Euphemisms were used frequently to name deities in Ancient Egypt, to avoid divulging the sacred name of a deity to the uninitiated and to avoid unauthorized uses of the name. References to the west also relate to the place where the dead enter the underworld, relating to her role as a funerary goddess. The alternative spelling names Amentet or Imentit sometimes were used to refer to her role in the underworld, where the goddess provided a welcome to the newly dead. She was associated with an acacia tree that was said to be near Heliopolis, where bread was provided for the surrounding population during winter when their food supplies were limited. 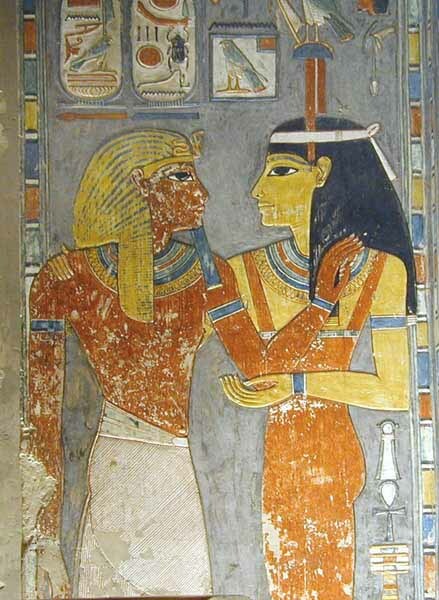 < When Amun became regarded with greater importance and his identity increasingly overlapped with that of Atum, Amaunet, as the female aspect, became increasingly identified with Iusaaset. Iusaaset was seen as the mother and grandmother of the deities. By becoming identified as Iusaaset, Amunet was regarded as the mother of creation and she was seen as owning the tree from which all life emerged and returned, the tree of life, an acacia tree said to be located on the desert's edge to the west of Egypt at Heliopolis. Its strength, hardiness, medical properties, and edibility resulted in the acacia tree being considered the tree of life. What was thought to be the oldest acacia tree in existence, the one which was situated close to, and north of, Heliopolis was said to be the tree of life. Its location was said to be the birthplace of all of the deities. Thus, as the mother, and grandmother, of the deities, Iusaaset was said to own this tree. When Amunet later was displaced as Amun's consort by Mut, she retained her own individual characteristics. Amun went through many changes and became the patron deity of Thebes and rose to become the most important deity in that city and, for a while, the country. While continuing to represent the air and the invisible, Amunet was said to have become associated with Iah, the moon, and was depicted in association with the Moon on tombs, coffins, and sarcophaguses.